Westmead A5C staff nursing unit manager Kelly Bivona, clinical nurse specialist Christina Teng, nurses Yee-Man Leung & Fe Linda Cadavero and clinical nurse specialist Daryl Parker. 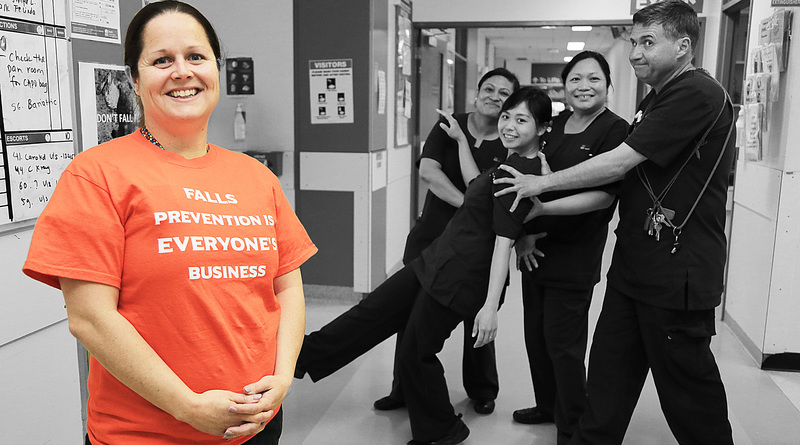 Wards across Westmead and Auburn hospitals have been busy preventing falls on their watch, as part of the most recent My Experience Matters survey challenge. In August, just under half the patients from both hospitals reported receiving falls prevention education – a number the LHD’s carer and patient experience team are keen to improve! Wards have made a pledge to provide falls prevention education to all patients during September and October. The ward with the best result, according to the My Experience Matters survey, will be named the winner and receive a superstar hamper to share. C3c and A5c are leading the way at Westmead Hospital while medical ward C is in the lead at Auburn Hospital. Good luck to all – we’ll announce the winners soon!